A custom wall unit by Komandor is can be configured in any way and fit to the exact measurements of any space. 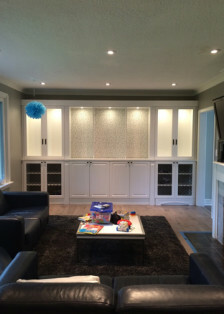 It can be designed wall to wall, floor to ceiling (or just below the ceiling in this case) and a wall unit can have as much covered storage or open display space as you choose. 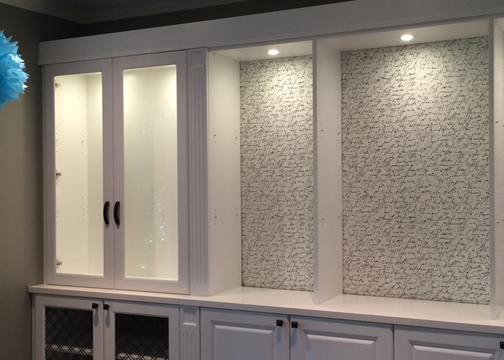 For this wall unit project, our customer was looking for a cabinetry solution that would balance their needs for covered storage and display space. They had a specific traditional style in mind and had even chosen a cabinet door grill insert and custom wall covering that they wanted to incorporate into the final design. Grill inserts in the lower cabinet doors on the left and right side. LED lighting and glass shelf display area. 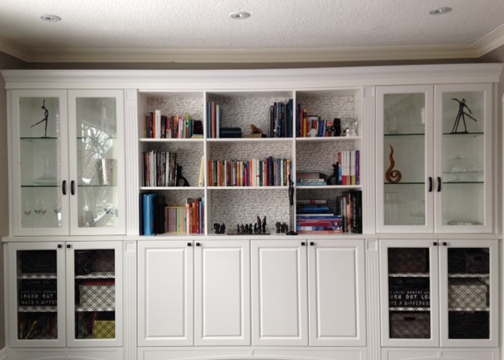 Crown and fluted moldings and arched toe kicks give a furniture look to the project. 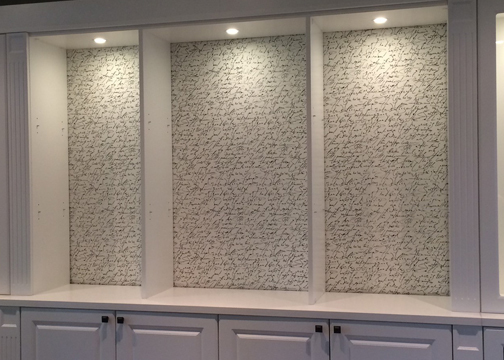 A custom wall covering in the centre section which was installed instead of traditional cabinet backing. This wall unit was designed with a traditional aesthetic. The crown and fluted moldings, arched toe kicks and raised panel cabinet doors give it a substantial look and feel. 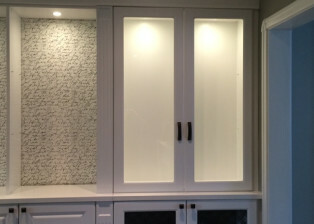 If the traditional aesthetic is not for you contemporary or transitional design can be achieved by changing the type of material used, door and molding styles. The use of lighting in this project really helps to create a visually pleasing design. An LED lighting system was chosen because very little heat is generated when the lights are on (as compared to halogen, xenon or other popular choices) and more importantly, much less power is required to illuminate the space. The end result is quite impressive. 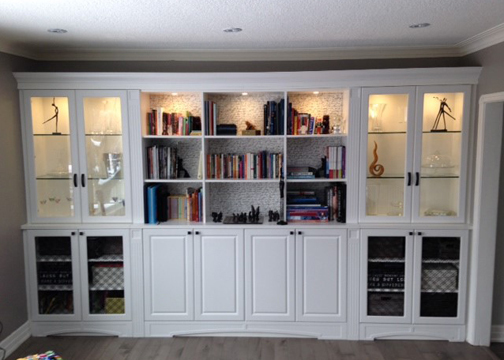 The new wall unit balances form and function and will be enjoyed by the client for years to come. 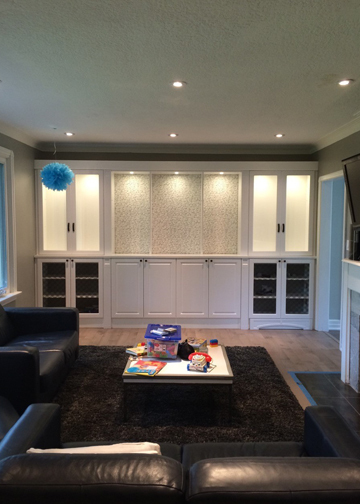 Please Contact Us if you are interested in a built-in wall unit or would like more information on other Komandor products.